Class-B floral homeotic genes are involved in specifying petal and stamen identity during flower development in plant species. Homeotic transformation of stamens into pistil-like structures (called pistillody) has been observed in alloplasmic lines of bread wheat (Triticum aestivum L.) having the cytoplasm of a wild relative species, Aegilops crassa Boiss. To obtain information about the molecular mechanism underlying pistillody induction, we isolated two PISTILLATA (PI)-type class-B MADS-box genes, WPI1 (wheat PI STILLATA # 1) and WPI2, from wheat. Phylogenetic reconstruction indicated that WPI1 is orthologous to OsMADS4 and that WPI2 is probably an ortholog of OsMADS2. Both OsMADS4 and OsMADS2 genes were suggested to be PI orthologs in rice, and the function of OsMADS4 as a class-B gene was proven by the transgenic study. An in situ hybridization study demonstrated that the WPI1 gene is expressed in primordia of lodicules and stamens in developing florets in wheat. 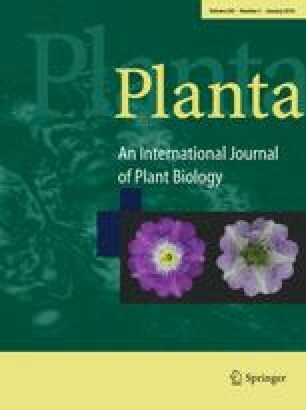 In the alloplasmic wheat line exhibiting pistillody, the WPI1 transcripts were not detected in the primordia of pistil-like stamens, whereas WPI1 was expressed in the lodicules. The wheat APETALA3 (AP3)-type class-B MADS-box gene WAP3 (wheat AP3)/TaMADS#82 showed an expression pattern similar to that of WPI1. These results suggest that pistillody in alloplasmic wheats is caused by alterations to the expression pattern of class-B MADS-box genes. We are grateful to Dr. H.-Y. Hirano for valuable suggestions. This work was supported in part by a Grant-in-Aid for Scientific Research (B) from the Ministry of Education, Science and Culture of Japan (No. 12460006 to K.M.) and from the Fukui Prefectural Government (to K.M. ).